Marcus Aurelius (121-180 BC) was emperor of Rome at the height of its influence and power. One can only imagine the pressures that a person in his position might have experienced. The military might of the empire was massive, and much could happen in the fog of war. Conspiracies ran rampant through the imperial court. What might be lurking right around the corner seemed unforeseeable. Economies flourished and fell into ruin. Barbarians at the Gates! And if Marcus was stressed out, how much more might the ordinary Roman suffer from this uncertainty? But, as we start 2015, is Marcus’s world really all that different from ours? Today, global financial markets seem to move of their own accord as life savings vanish. Conflict around the world and violence at home seems hopelessly incomprehensible for most of us. US elections have seen some of their lowest voter turnout in recent memory, and the country seems more polarized than ever. The constant flow of information from the media and Internet can make one feel small and ineffectual. If all these stresses push one into a state of despair, or at least a sense of futility, maybe we can follow Marcus’ advice and turn to philosophy. In particular, the philosophy of Stoicism. Stoicism was founded in Athens around 300 BC, and had its zenith during the Roman Imperial period of the 1st and 2nd centuries AD, in the writings of such thinkers as Seneca and Epictetus, as well as Marcus Aurelius. Stoicism promised that a good life is available to us even in the face of overwhelming circumstances, which might partly explain its attractiveness to even the mighty emperor of the most powerful empire of its time. Central to this life, according to the Stoics, is a certain set of cognitive approaches to what goes on in the world around us. First, we must recognize that the vast majority of circumstances and events are out of our control. What is in our control is how we react to them. Thus, what matters to having a good life is not what happens to us, but rather how we deal with it. The second major point is that those things under our control -– our thoughts – are both the source of our suffering, and something that we can learn to control. When we learn to have the appropriate reactions and thoughts, we can then live a happy and fruitful life even in the face of enormous difficulties. If you think that things naturally enslaved are free or that things not your own are your own, you will be thwarted, miserable, and upset, and will blame both gods and men. But if you think that only what is yours is yours, and that what is not your own is, just as it is, not your own, then no one will ever coerce you, no one will hinder you, you will blame no one, you will not accuse anyone, you will not do a single thing unwillingly, you will have no enemies, and no one will harm you, because you will not be harmed at all. A growing number of deeply thoughtful people, from scholars to practicing therapists, are following Marcus’ advice today. For example, a group at the University of Essex in the UK has developed “Stoic Week,” and produced guidelines for anyone to participate in stoic practices for a week and share their experiences. Having just concluded its third iteration, this experiment in stoic living has indicated that stoicism may in fact be a helpful tool in modern life. Preliminary results from the first stoic week suggest that the majority of participants had significant reductions in negative feelings associated with stress and anxiety, etc. The practice of stoicism is also now being pursued in the US. The University of Wyoming hosts a Stoic Camp, first run in May of 2014, putting students and faculty together to live by stoic principles on a 24 hour basis. Based in the Snowy Range outside of Centennial, WY, the initial camp hosted only students from Wyoming, but further iterations will accept students from other universities. On a typical day, campers rise early in order to practice meditation based in the ancient texts and use this practice to help structure the rest of the day. 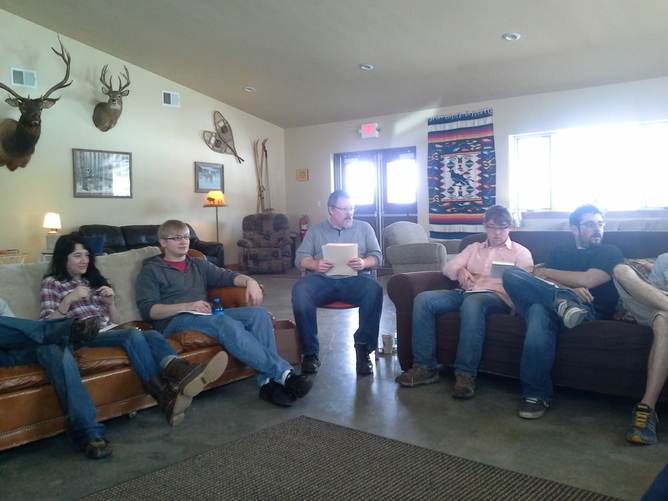 Each morning and afternoon, the camp breaks into groups to read and discuss portions of Marcus’s Meditations and consider how they reflected his stoic values and advice. By repeating this process, these ideas can become part of our cognitive equipment. Campers also engaged in outdoor activities to emphasize our affinity with nature and the universe as a whole. So, these cognitive realizations and tools may help us to live a happy, fruitful life. As the Stoics emphasize, however, such a life cannot consist in making the world bend to our will. Rather it must consist in making ourselves more fit to live well in the world as it is. Robert S. Colter , Academic Professional Lecturer, Philosophy at University of Wyoming, does not work for, consult to, own shares in or receive funding from any company or organisation that would benefit from this article, and has no relevant affiliations.